If Lonnie Smith considers himself “the doctor of groove,” then Mama Wailer is certainly his doctoral thesis. This 1971 record was only the second of Creed Taylor’s Kudu productions and, surprisingly, the only Kudu or CTI session Lonnie Smith ever participated in. But the record has become a jazz-funk classic; one of the rarest of rare grooves and still highly sought after by young dancers and DJs alike. All in all, it’s a superb collection of long, exploratory ideas on the nature of groove and the real “turning point” in Lonnie Smith’s musical thinking. Only six short years before, Lonnie Smith got his start in music when George Benson handpicked him to man the Hammond B-3 in the guitarist’s first group. Benson and company also backed Smith on the organist’s solo debut, Finger-Lickin’ Good (Columbia-1967). By 1967, Lonnie had joined Lou Donaldson’s band, creating one of the bop saxophonist’s most popular groups and yielding such acid-jazz classics as “Alligator Boogaloo” and “Peepin.” Lou Donaldson secured a recording contract for Lonnie Smith at Blue Note records, where the organist waxed four fine slices of Hammond B-3 soul (and one live session from the period that was released many years later). When Francis Wolf left Blue Note, Lonnie left too. Famed producer Creed Taylor tapped the soulful funk organist right away for Mama Wailer. By this time, Smith was gradually emerging from the chock-a-block funk and R&B settings of his Blue Note days and beginning to explore a keyboard’s potential to enhance or color the grooves. Larry Young had also begun doing this a few years earlier. By the time of Mama Wailer, Young was already charting the subversive territories of Lifetime. Smith, on the other hand, seemed more of a rhythmic colorist, one intent upon communicating through the groove. Mama Wailer is one of his first experiments in this direction. Indeed, the title track begins the record without any organ to be heard at all. Smith takes a giant leap of faith, comping and soloing with the limited capabilities of the clavinet, an electronic keyboard that sounds dulled and drained of any resonance whatsoever. Still, Smith stretches the instrument’s limitations and delivers a strong, thoroughly affecting urban funk. The ostinato riff is carried by the horns and highlighted by Marvin Cabell’s urbane tenor solo and Robert Lowe’s metallic guitar. Smith’s own feature, “Hola Muneca” follows. If there is such a thing as funky drone, this is it. First performed by Smith in 1967 on his Columbia debut, this new version is funk in the raga sense. Smith slices and dices the groove rather imaginatively here on his more familiar organ, offering more of a signature sound than he has ever displayed before. He hints at something avant garde while clearly never distracting from what might move your feet. Carole King’s “I Feel The Earth Move” follows. This song and others from the writer’s landmark album Tapestry (Ode – 1971) really did shake the earth back in 1971. There were certainly few places in America you could go that summer without being totally aware of this album and all the hits it generated. Here, Grover Washington, Jr., treats the organist to a highly charged funk arrangement, propelled by the electric bass of Chuck Rainey. Note the poetic tremors Smith employs here and the way he really makes the ground swell. The album’s centerpiece is surely “Stand,” one of the bold social statements from Sly And The Family Stone’s monumental album of the same name (Epic – 1969). Originally, Lonnie’s version took up a full side of an LP. But he made every minute count, sculpting a panoramic view of urban America. In a great tribute to the song’s author, Sly Stone, Lonnie Smith treats us to a summer day in the ghetto. He gives the main theme a nervous beat, then grinds the funk to a slow burn for the solos – which find the organist weaving in and out of spots featuring Grover Washington’s tenor and Jimmy Ponder’s guitar. Then, just as suddenly, a sort of chase ensues, driven by Ron Carter’s hot-as-asphalt electric bass (astute listeners might recognize how Smith revisited this section in his own “Jimi Meets Miles” from 1994’s Foxy Lady). Grover yields to a scorching solo that wends into a stoned groove from Ponder’s guitar and finally segues into the kaleidoscopic finale of Smith’s solo. A masterpiece of social groove. 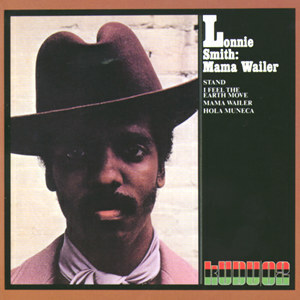 Lonnie Smith seemed to disappear after Mama Wailer. His next record, Afrodesia (Groove Merchant), didn’t appear until 1975. Similar in many ways to Mama Wailer, Afrodesia offered long, exploratory funk vamps and adroit contributions from Smith, George Benson and tenor titan Joe Lovano very early in his career. While at Groove Merchant (and later, LRC), Smith – like fellow organist and occasional musical partner, Jimmy McGriff – participated in nearly a half dozen of Brad Baker’s disco orchestras, playing an arsenal of synthesizers, electric keyboards and adding his own brand of vocals to some of the more insinuating dancefloor classics of the disco age. By the early 1980s, Lonnie Smith had become turbaned and called himself “the Doctor.” But Dr. Lonnie Smith disappeared from records again. Disco died and his style of soul seemed to fall out of favor in the ultra-conservative Reagan era. Smith relocated to South Florida, where he still resides, and to this day has contributed mightily to the local scene, playing and recording prolifically (and with increased authority) with such local talent as Terry Myers, Turk Mauro and Jesse Jones, Jr.
As the 1990s dawned, acid jazz broke open and many of Lonnie Smith’s old records, like Mama Wailer, were suddenly highly-prized collector’s items. People were grooving to Lonnie again. He toured extensively in acid jazz groupings and resumed recording in such soul-jazz collectives as the Jazz Funk Masters (P-Vine), Chartbusters (Prestige), Secret Agent Men (Paddle Wheel) and the Essence All Stars (Hip Bop). Dr. Lonnie Smith also re-ignited his own recording career in the 1990s, waxing some of the finest work he’s ever done. So far there’s been The Turbanator (32 Jazz – 1991) and the exceptional trios for his John Coltrane tribute, Afro Blue (Venus – 1993), and the awesome Jimi Hendrix tributes Purple Haze (Venus – 1994) and Foxy Lady (Venus – 1995). He continues to record and tour the world extensively with Lou Donaldson and has become, even at this point in his career, a first-call session man in New York for a variety of organ dates. However, Mama Wailer endures as the cornerstone in Dr. Lonnie Smith’s journey to the groove.